Si vede che essere nella stessa squadra di calcio (vedi post precedente) ha fatto bene ai due maggiori contendenti (congresso e maoisti) nel lungo processo (7 anni) per dare al Nepal una costituzione e un quadro politico stabile. O, più probabilmente, le immense responsabilità dopo il terremoto hanno svegliato anche la classe politica. Speriamo he duri. The parties have agreed on an eight-provinces federal model based on five bases of identity and four bases of economic viability. The provinces will be named through two-third majority of the province assembly. 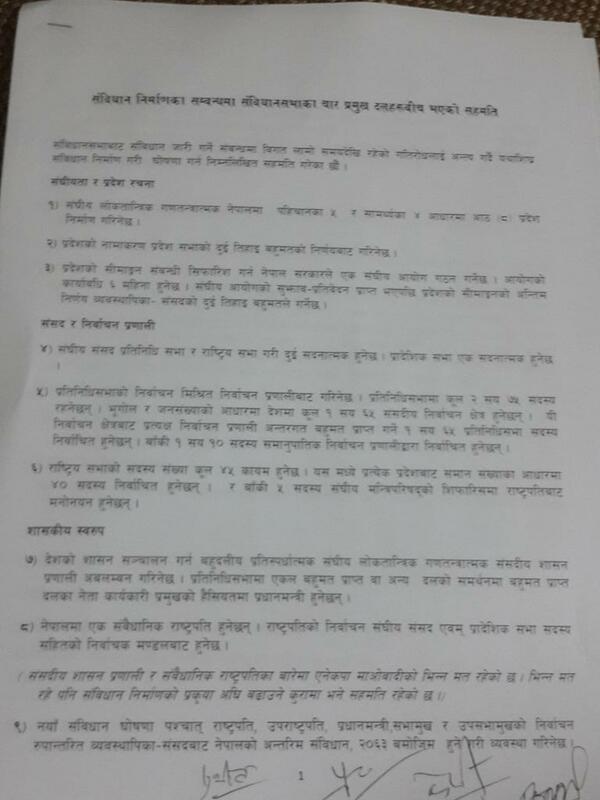 A federal commission will be formed on delineation of provinces. The commission has been assigned to complete the task within six months. The delineation of the provinces will be endorsed by two-third majority of the Legislature Parliament as per the recommendations by the commission. Prova ad andare su Facebook Take care Nepal, è un progetto per i villaggi di Kavre. A meeting of the Constituent Assembly (CA), on Friday, had given 15 days to prepare and submit a draft of new constitution to the Drafting Committee. Speaking at the committee meeting held on Sunday, Sitaula said that the committee has officially begun the work to prepare the draft of the new constitution.